Somethings are indeed forbidden. This request was not. This entry was posted in Uncategorized by tgcaptioncafe. Bookmark the permalink. Thank you, sir. I am glad that you enjoy the choice of art for the dish. I’m not going to repeat it all there, merely post the link as I did before. If you can’t view it then tell me and I’ll try to provide it as before. If you’ve got the comment but it needs confirmation because of length, then okay. Basically it was a thank you for taking up on the idea I once proposed and in thanks, I gave you what it was on my side. Calinde Enyeles renamed herself to Calinde Elestar to honour her oath of sisterhood with Averëon Elestar. It was accidentally found out that Calinde means Sister of Eternal Faith. Became a war hero of an elven village she joined and was brought back from the dead by the head priestess who in turn called on to the creator of elves. She met Averëon Elestar and was adopted as her younger sister through an oath. It’s impossible to figure out the two are not related by blood but perhaps that will change. Magic is capable of some crazy things regarding blood and there is a friendly blood mage in the neighbour. In that picture at the bottom the one wearing the dress is the one who suffered Eheh. Don’t ask how the other elf, Averëon forced her into it. I have a feeling a game of poker was at hand..
And in case my other comment is gone, I also remarked how Thomas has the same experiences as Calinde had in the first few months. Rereading this caption it dawned on me that you’ve done 2 requests in one! Awesome! Even if it was unintended, that mage part makes me feel like it’s regarding the Pete/peta Make-over mage of Runescape! I would have liked a name. One of the hardest parts about making a dish is coming up with names. You are welcome to use the art. I have no claim to it besides using it for a dish. I am glad that you enjoy your request. I would have wish to had some of this information sooner and that I had fully understood the request. To be honest, I had this one for so long that I forgot if I combined your request on purpose or not. Still, if you are happy with this request then that is good. 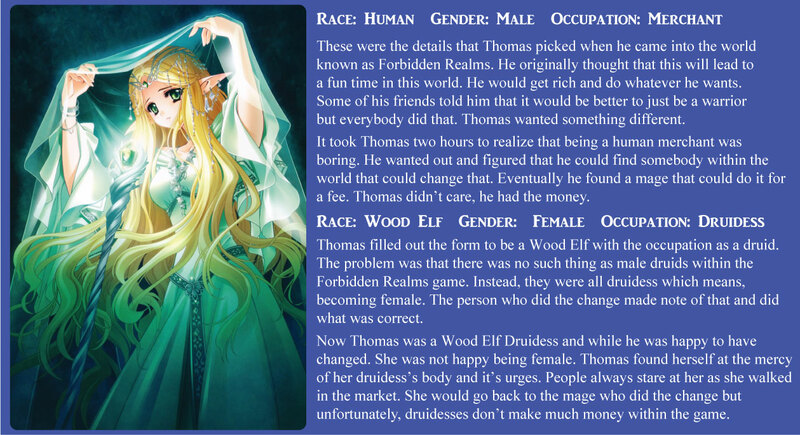 It’s actually better this way that you just took “Human male merchant to female wood elven druid” than take the whole story of Calinde. It’s more fun for me to read at least what others can do with that idea! I wonder which path will she end up on.. the happy good path, the sour path or the eternal straggler. Also! The picture gave me some ideas on an elven wizard or sorcerer. Can I use it as concept art for the character? If it matters, the character won’t have any TG elements. I’m trying to avoid strange characters for the meantime. Hoihe and Calinde are curious enough.